The November NORBAG workshop will be taught by Becky McAllister. First she will begin with general information on the various products for stamping and heat embossing, then move on to demonstrations of techniques. Next everyone will have an opportunity to try any and all of the techniques. Since the holidays are just around the corner (yikes!!) 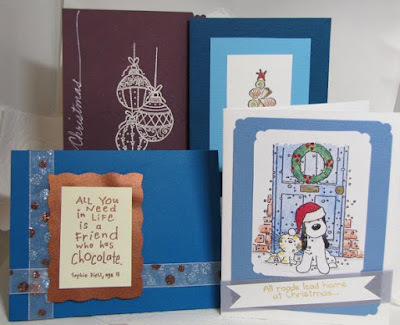 this workshop will provide great ideas to make cards, gift tags, and even wrapping paper. Also think about how you can incorporate them into pages for future books or interesting tags for book pockets. Becky will bring lots of rubber stamps, stamp pads, embossing powders, heat guns, and a variety of papers to try. Hope you will come to play! * ROOM CHANGE NOTICE * Our regular meeting room will not be available in November. We will be meeting in Room 8 (Fireside Room). Park on Sonoma St. between F & G Streets and go through the gate. There will be signs to direct you. 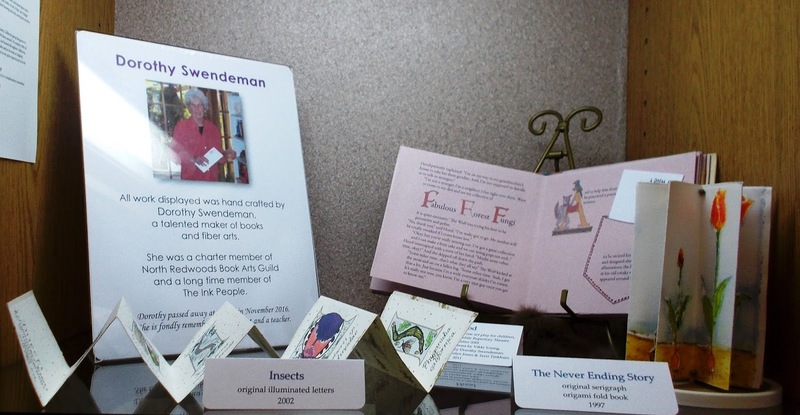 Kathy Warren attended the Newport Paper and Book Arts Festival (NPBAF) this year and took a class making a leather bound tiny book that can also be wearable art. Now Kathy has taught us to make one of those books and use jewelry findings to turn it into a necklace (or booklace if you prefer). 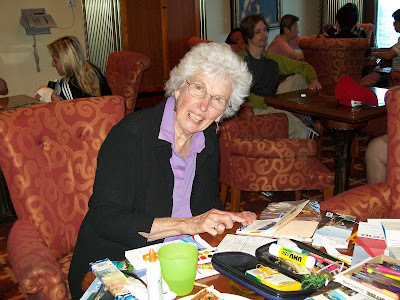 Kathy made kits for each of us that included everything from the signatures through the beads and jewelry findings. This isn’t one of those little jewelry pieces that just looks like a book. Although it is only 1 ½” by 2” in size, it is a casebound book with four signatures, a leather spine, stitching on the cover and a leather and bead closure. We added a jump ring, a thong and closures to make it into a necklace. 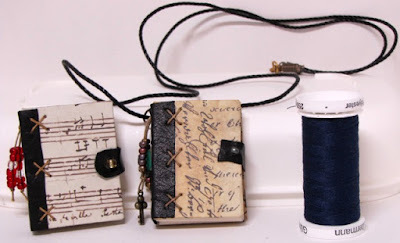 some as necklaces and others as simply tiny books. for sewing patterns and how to affix the jump rings to the books. We started by covering our tiny little boards. You can see by the pictures how small these books are and also the variety of decorative paper that Kathy supplied. to the appropriate size and then below, you can see the gluing. We clipped the corners (above) and then glue and fold over the edges (below). We ended up with two nicely covered panels (this is the inside of the cover). will become the closure) we glued the edges (below). We then adhered the leather to the cover leaving an open space for the spine. (not only decorative, but it also ensured that the leather stayed in place). This picture shows the sewing of the decorative stitches. The photo below shows the first side being completed. The stitching was mirrored on the opposite side of the cover. The signatures were stitched through the leather and tied off. and then sewn to the back of the book and then slit to make an opening for the bead. 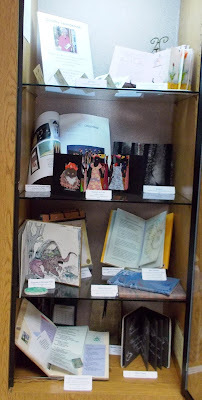 Here are a number of photos of our books in progress. Each picture reinforces how small these lovely little books are. This artist used different thread colors. Tiny books are fun to make and perfect to give as gifts. 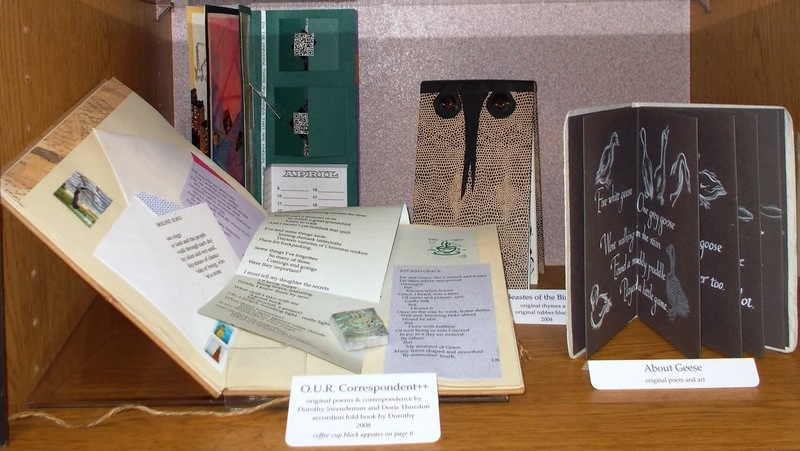 At the October NORBAG workshop Kathy Warren will teach a variation of the Booklaces course taught by Doris Arndt at the Newport Paper and Book Arts Festival in 2018. The tiny books are easy to make, but the jewelry-making part can be a little more daunting. 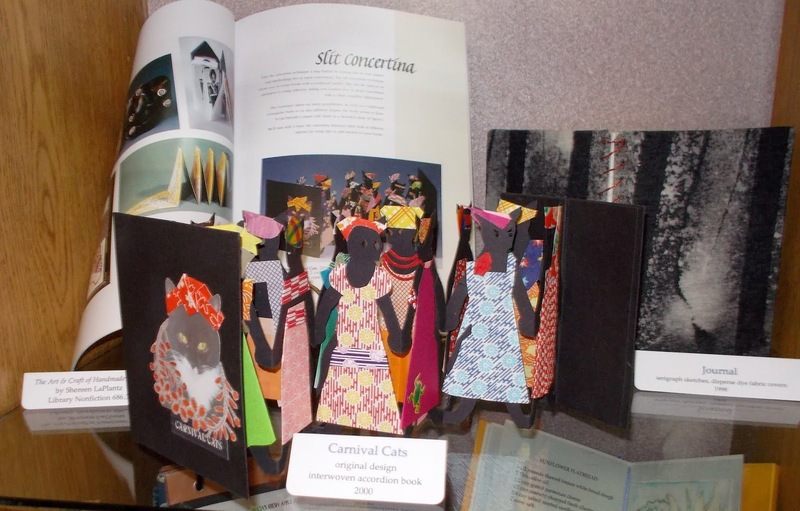 Kathy will demonstrate the bookbinding, and after books are completed she will help those who want to go on to make necklaces. She will have pliers, jump rings, beads, ribbon, wire, yarn and bangles available. If you have any of these items you would like to bring to enhance your own "booklace" please feel free to bring them. Kathy will provide: pre-cut leather in several colors, pre-cut board, pre-cut signatures, text weight decorative papers for covers, jigs and information sheets. The finished books will be 1 1/2" x 2" in size.